The waters of the Iowa Great Lakes may be frozen now, but they were high enough to all but halt boat traffic five months ago. And while wave and erosion control are on the back burner this winter, the Iowa Great Lakes Association is taking the first steps to get a scientific handle on the local water system. 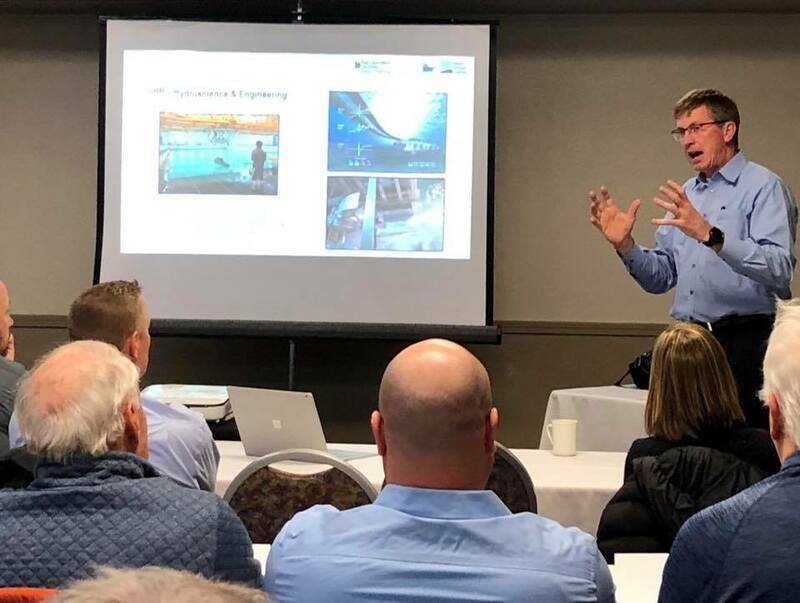 The nonprofit invited local government officials and environmental figures to the Arrowwood Resort and Conference Center in Okoboji Wednesday to hear from a group of experts at the University of Iowa. Van Orsdel reached out to the University of Iowa and was put in contact with Dr. Larry Weber of the university’s hydroscience and engineering department. Weber and his colleagues, Dr. Macela Politano and Dr. Nate Young, are using an mathematical model developed for understanding watersheds statewide. Weber told the group Wednesday some 951 presidential disaster declarations have been made in Iowa due to flooding in the last 30 years, with some counties tallying more than 20 declarations. The group’s findings are still in their preliminary stages, but Weber and Young said the team will run several simulations based on the data collected and make recommendations in the coming year. Weber stressed the group will not endorse a particular course of action but will explain several options in its report. Weber and his team studied a 540-square mile area, stretching into southwest Minnesota. Weber said, in his opinion, the mathematical model developed by Politano is one of the most sophisticated in the world. The model factored for soil conditions, rainfall, evaporation rates and a number of other aspects in the watershed. The study area was divided into 14,000 triangular sections ranging from 80 to 100 acres each. Weber said the Lakes Area has definitely been experiencing more intense rainfalls recently. He said their data showed 15.5 inches of rain fell over an extended period between June and July of 1993 — the year of one of the Lakes Area’s most notable flooding events. However, the high waters which stunted summer boat traffic this year came about with only 9.5 inches of rain. Weber indicated the swollen shores may compound heavy rains after the thaw. Specifically, the team will be examining what changes to the Lower Gar Lake outlet, if any, will be most effective for flood management. The outlet passes under a road via several culverts. The county and the city of Milford share ownership of the road. Young said eight elliptical culverts were in place before 1993, and an additional 12-by-5 foot box culvert was added after that year’s flood. In 2010, two 14-by-4 foot box culverts were added at a higher elevation, out of concern too much water would be released from Lower Gar, according to Young. If the roadway were to be completely removed, Young said preliminary results show the water level in the area upstream would drop 2 feet in high flood conditions, but minimal change would be seen in low flow conditions. Weber said the team will evaluate the affect of leaving the roadway, removing the roadway and potential changes to the weir. Van Orsdel hopes, when further calculations are complete in the spring, the various government bodies of the area will come together to agree on a path forward. Van Orsdel said the study is underwritten by the IGLA and local businessman Tom Clary for approximately $125,000. He hopes to raise funds in the community to offset the cost at a later date. “I’m not so concerned with the money as I am with coming forward with a professional study that can’t really be questioned because of the abilities of Dr. Weber and his staff,” Van Orsdel said.